Despite the communal nature of food and consumption, this project investigates our relationship to food on a personal and biological level. Advertising, package design, and food additives are among the many tactics used to directly effect the senses. Whether it is with the suggestive advertising power of color or a manipulative food enhancer such as monosodium glutamate (MSG), consumers are primed to be both consciously and more importantly subconsciously conditioned to indulge in (or refrain from) the tasty pleasures of life. This interactive body of work that addresses these commercially-appropriated biological responses is called Appetite Apparatus. These various simple sculptural apparatuses examine food marketing, processed foodstuffs, and everyday consumption. 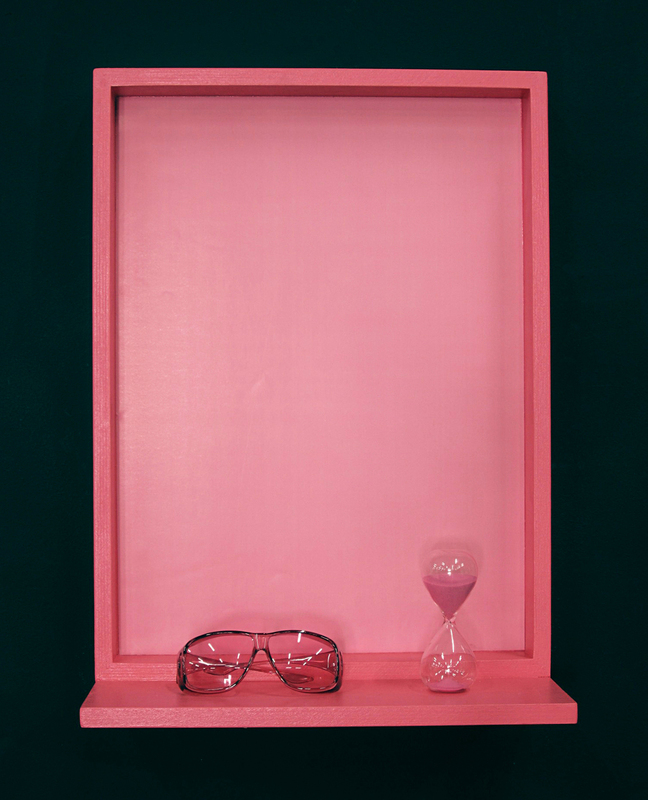 Appetite Apparatus #1 (Baker-Miller Pink, Suppressant) is a wall-mounted structure which provides the viewer with a framed 18X24 inch poster of the exact pantone of Baker-Miller Pink, a scientifically proven shade of pink that suppresses aggression and appetite. Mounted in front of the poster is a shelf containing weight-loss color therapy glasses of the same color and a 15 minute timer. When you put on the glasses and stare at the poster for 15 minutes, you will eventually lose your appetite. It is with this biological response Appetite Apparatus makes aware of these manipulative methods that can trigger and alter the physiology of the senses and the brain. With these sculptures, Appetite Apparatus presents a rare opportunity to physically alter the viewer, effectively changing the way they will interact with food and possibly other people after they step away from my work.